Open image files with ease using Image Explorer. 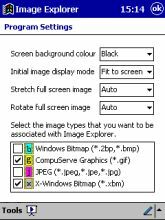 Supported file formats are Windows Bitmaps (2bp, bmp), all GIF formats (gif), standard and progressive encoded JPEGs (jpeg, jpg, jpe) and X-Windows bitmaps (xbm). Limited Edition Version 0.3 allows you to zoom in and out of images, zoom to original size, fit to screen and view image file properties. Drag on the screen to move the image around if it is larger than the screen. 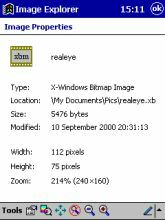 Full screen mode to use the whole of your Pocket PC screen to display an image. Program settings will amongst other things allow you to change the starting display mode and set file associations. The Exhibit function will allow you to display images in the current listing as a presentation. 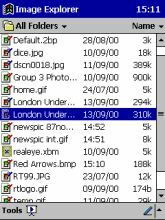 Browsing below the "My Documents" folder: To keep the program small I have re-used features resident on your PocketPC. Unfortunately, these prevent free directory browsing. 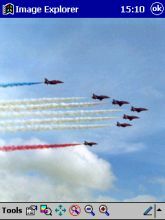 Rotating images: It is planned for the program to automatically rotate images when appropriate. I doubt there will be a feature to rotate an image on demand. Other requested features such as sound, annotation, albums and thumbnail previewing are not likely to be worked on. There are several commercial programs that implement these features. If I do add these features, I doubt Image Explorer will remain as freeware. Extensive testing has only been done on the Casio Cassiopeia E-115. Report any problems to imgexp@tangcode.co.uk.